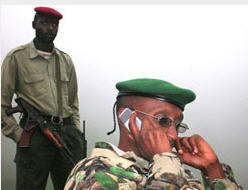 KINSHASA, 28 September 2007 (IRIN) - The Congolese army has launched an appeal for militias loyal to renegade army general Laurent Nkunda, as well as other combatants and armed groups in the eastern province of North Kivu in the Democratic Republic of the Congo (DRC), to be integrated into the army or be demobilised. "I am particularly calling on [missing] Forces armées de la RDC [FARDC, the national army] militias, because they are paid by FARDC, to go the brassage centre," Lt. Gen Dieudonne Kayembe, the Congolese army commander, told reporters on 27 September. Kayembe said four assembly points for the reception of the militias would be opened in Sake, 27km west of Goma, the main town in the province. Other points would also be opened in the Masisi area and in the territory of Rutshuru, he said. Food would be provided at the assembly points which would also have an orientation centre, he said. Meanwhile, FARDC announced the integration of a group of 132 combatants from North Kivu at the Kamina orientation centre in the southeastern province of Katanga. According to the deputy commander of the Congolese army in the province, Col. Delphin Kahindi, most of those integrated were militias who had defected from Nkunda's ranks while others were Mai-Mai militias. The militias had the option of being integrated into FARDC or being demobilised to rejoin civil life, Kahindi said. The appeal was launched as new clashes were reported in the province between the army and Nkunda's forces after a two-week ceasefire negotiated by the UN Mission in the DRC (MONUC). At least 300,000 people have been displaced by fighting between and among different militias and government forces in the province since the end of 2006, according to humanitarian agencies.